A celebration of the life of Eldridge Morton Moores III will take place at 3:30pm, November 18, 2018 in Wright Hall, Main Theater, on the campus of UC Davis. The UC Davis Symphony concert, scheduled for 7 pm that evening at the Mondavi center, will be dedicated to the memory of him. It is with a heavy heart that the board and staff of Cool Davis offer our deepest and heartfelt condolences to his closest family on the event of the passing of Eldridge Moores. Everyone held this Distinguished Professor Emeritus of Geology in high esteem. He was loved by students, admired by faculty, and praised by fellow geologists across the country and beyond. His many friends and fellow musicians (he played cello and piano) adored him, too. Cool Davis enjoyed a long and rewarding relationship with Eldridge Moores and his wife Judy, who co-founded Cool Davis. 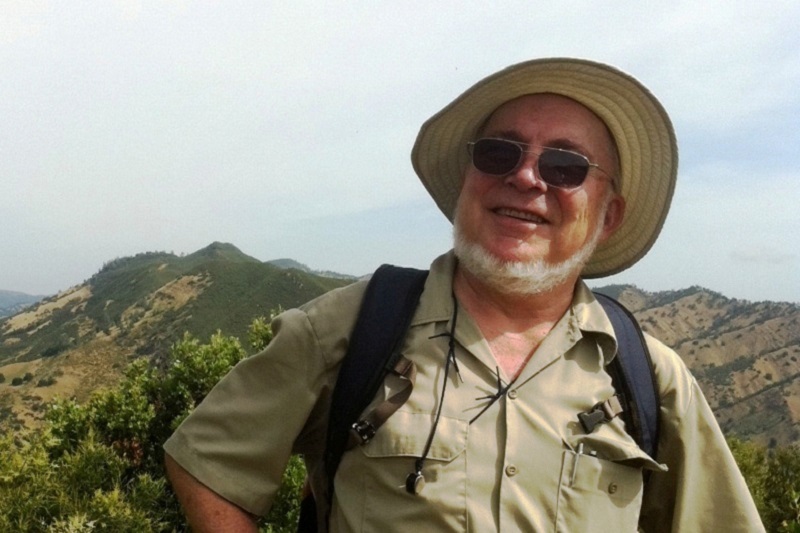 While his obituary tells the story of his brilliant and extensive career in geology, at Cool Davis we counted on his expertise and help, appreciated his many gifts to our organization, and delighted in his helpful, gentle spirit. In a way, Cool Davis came about through Eldridge’s geology society. Judy often accompanied Eldridge to the yearly gathering of geologists. In 2003, they attended the annual conference where they heard a lecture on global warming that awoke Judy to the grave peril of her beloved Earth. The speaker was blunt: Global warming endangers all life on earth. The U.S. had declined to sign the 1992 U.N. Kyoto treaty to begin reducing carbon pollution, and the serious problem was escalating. She came home scared…and determined to do something about it. Judy spent the next four years at the Unitarian Universalist Church of Davis guiding the congregation through the rigorous program to become a Green Sanctuary. Eldridge often hangs out the laundry to dry, sparing the use of electricity. Eldridge fully supported Judy’s efforts during his first busy years of retirement when he served as vice president of the International Union of Geological Sciences, traveled the globe to encourage international cooperation in the earth sciences and the sustainable use of resources, served as a member of the UC President’s Science and Mathematics Initiative, worked to increase offerings in geoscience nationwide, and published second editions of two of his books. Meanwhile, Judy gathered a committee and learned how to encourage church members to change to a “low carbon diet.” Through discussion courses like Menu for the Future, speakers like Richard Heinberg, a conference featuring Julia Butterfly Hill, workshops on green cleaning and green investing, setting up recycling and composting, and much more, Judy and an eager committee gradually reduced the carbon footprint of the church and its members. In four years the Unitarians earned the Green Sanctuary certification, and Judy turned to the larger community of Davis. Judy co-founded Cool Davis with its mission to inspire our community to reduce greenhouse gas emissions, adapt to a changing climate, improve the quality of life for all, and have fun doing it. Cool Davis is ever grateful for the many ways Eldridge joined in our work. Given his remarkable academic stature, we marveled at his humble willingness to serve in any way we asked. Eldridge would often forward articles he thought might inform us, and he was always a ready resource on the science of climate change and its impacts. He offered his expertise freely and researched our questions. His generosity with his knowledge and his genuine concern to spread scientific information gave our fledgling organization credibility. 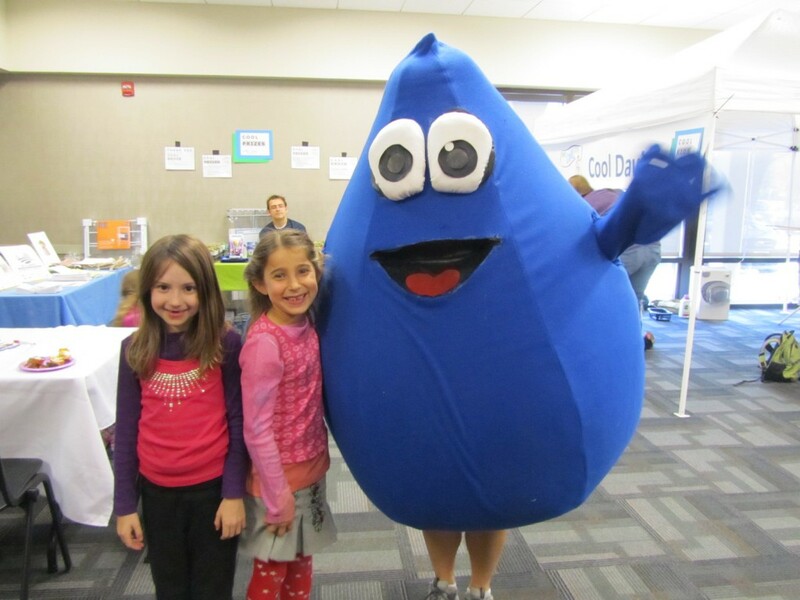 He had a busy schedule of his own, but we could count on him as a willing volunteer at any Cool Davis event. No task was beneath him, from taking names at the entrance table to cleaning up at the end. He came early, stayed late, and offered whatever support was needed to make our program, speaker, film, festival, or climate conference a success. 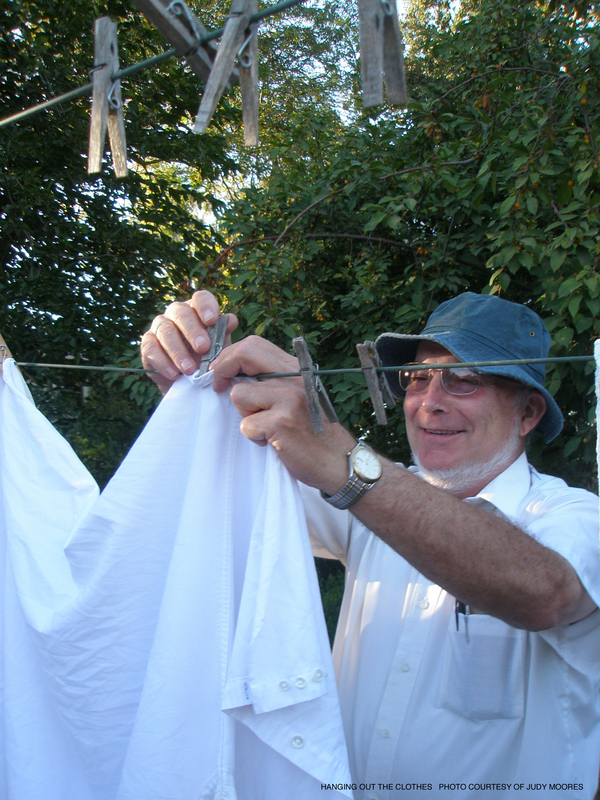 He was even willing to pose while hanging out the laundry to model the advantages of drying clothing by sunshine. When Eldridge was at a Cool Davis event or hosting a dinner at his home, it was never long before you would find him in conversation with a young student as they hung signs or handed out materials. His genuine interest in young adults and informal approach was disarming, often eliciting from them knowledge and expertise they didn’t know they had. Ever a masterful educator and mentor, Eldridge was always at work. Eldridge Moores on Blue Ridge while leading one of many geology car tours as fundraisers for Cool Davis. When Cool Davis needed entertainment, Eldridge would offer to play cello selections, for instance, for our Cool Davis donor thank you events. It was worth coming just for Eldridge’s concert. Together, Eldridge and Judy have been major fundraisers in our community for many groups they have nurtured: Tuleyome, Yolo Basin, Putah Creek Council, Green Sanctuary and the Unitarian Church, and Cool Davis. Eldridge offered a variety of geology car-caravan tours in our region, each route carefully driven the week before to plan the geological content and check for safety and feasibility. Meanwhile Judy prepared readings for each stop and handled the PR including a story in the Enterprise and Cool Davis newsletter and communications with participants. She kept the tours moving along. Celebrate the 2016 Spring Equinox with a geology road trip through the eastern Coast Ranges with renowned Geologist Eldridge Moores and his wife Judy Moores, and help raise money for Cool Davis at the same time! Cool Davis Board members will always remember Eldridge as a charming host at the year-end pot luck dinners he and Judy hosted at their home for the six years Judy served on the board. Delicious food, wine, and good company made for rich conversation into the summer evenings. “We live in a multicultural world with many environmental challenges, including global warming, peak oil, and resource limits. We geologists have a special responsibility to use our knowledge and skills to work toward sustainable development for all people, for all Earth and life. When we work internationally, we become diplomats for our countries and our science. It is increasingly important to be respectful and sensitive to cultural issues. Wherever we go, it is essential to reach out to local geologists and include them in our work in mutually beneficial ways. And those of us who are North Americans need to be especially aware of our overly large “ecological footprint,” and do our best to minimize our own personal impact. 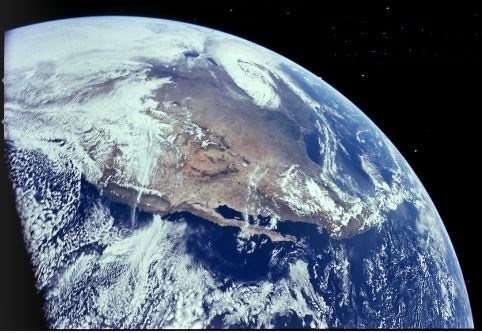 A view of Earth showing Eldridge Moores home state of California as well as Western United States landforms courtesy NASA. At Cool Davis we are grateful to have been favored by this fine man, and his equally fine wife, and we strive to take his words to heart and live them for the sake of our Earth home. 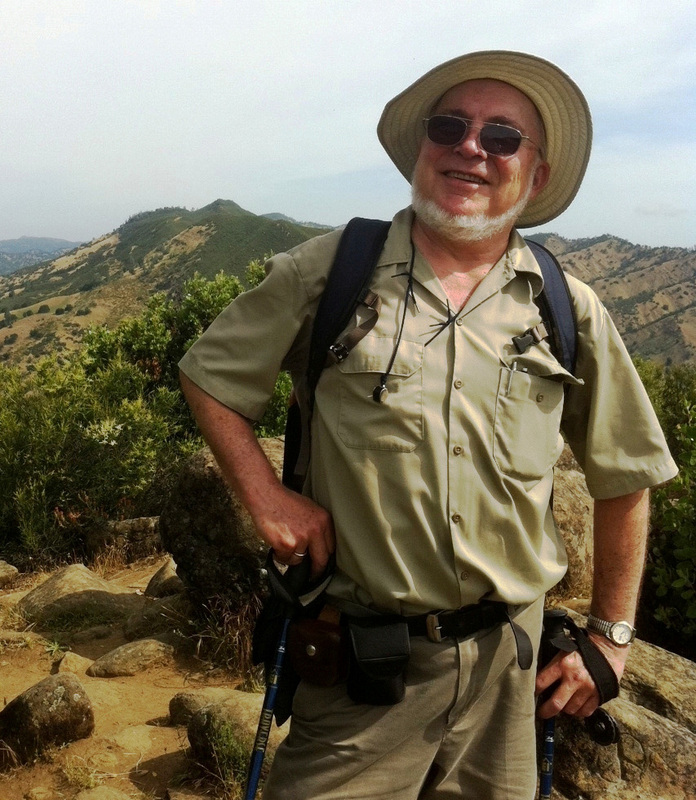 His death, which was unexpected and tragic, occurred in the Feather River canyon area, in the middle of his favorite pastime—leading a field trip, sharing his knowledge and excitement about geology. • Or contact Charlene Mattison, Assistant Dean, College of Arts and Sciences, at 530-754-2225 or cmattison@ucdavis.edu. Judy made La Gotita for fun! She’s been to many Cool Davis events, and children flock to her. Discover Gotita’s full story here.